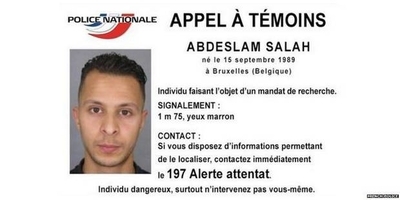 It took just over four months, but Belgian police on Friday tracked down an unexpected lead and captured Europe's most wanted terrorist: Saleh Abdeslam, the mastermind of the Nov. 13 attacks in Paris that killed 130 people and injured nearly 400. Trapped in a standoff in the Brussels district of Molenbeek, Abdeslam reportedly was shot before being arrested. Police found his fingerprints in an apartment they had raided earlier in the week – a week in which counterterrorist forces across Europe scored a number of victories against the growing threat of Islamist terror. With much of Europe on high alert even four months after the Paris attacks, investigations throughout the continent and the U.K. have been heightened, leading to a rash of arrests and convictions in several countries. In addition, and perhaps even more important, has been the extensive information leaked by an ISIS defector to Britain's Sky News. That information, stored on a memory stick the ISIS defector had stolen from ISIS leaders, provided a virtual treasure trove of intelligence – including the identities of over 20,000 jihadists, many of them Europe's own. But for all the successes of European counter-terrorism forces, the news is not entirely good. More arrests suggest more terrorists, and in fact, much data indicates that the number of European jihadists is on the rise. For example, the UK Home Office announced last week that terrorism-related arrests declined 3 percent in 2015. But that decrease, to 28 arrests, resulted from fewer separatist, domestic terrorist arrests. Moreover, the number of women arrested increased 50 percent over 2014, to 45. And a record 16 of those arrested were under the age of 18. In total, since late 2014, British authorities interrupted seven terror plots; and notably, 79 percent of all terror-based arrests in the UK since 9/11have involved British or dual-British nationals, not immigrants. What is particularly shocking is the number of young women who are becoming involved in terrorist plots – until recently a role principally filled by young men in their 20s. Women who did get involved in the past tended to be in their 30s and older, mostly widows of "martyred" terrorists or those who had been killed in Western air strikes. But the March 11 arrest in Paris of two teenage girls, aged 15 and 17, for plotting an attack on a concert hall demonstrates how rapidly the face of terrorism is changing across the West. In fact, European girls that age who radicalize more often go (or attempt to go) to Syria to join the Islamic State – though they are barred from taking part in military activities, a fact most of them know before they make the trip. Theirs is a supporting role, aimed at providing a loving home for their jihadist husbands (whom they are often forced to marry) and raising future-jihadist sons. But that young, Western Muslim girls, barely having put away their Barbies, would plot a "Bataclan-style" attack in Paris, reveals the growing influence and reach of ISIS and its recruiters. It is worth noting that the two young girls were also French nationals, again pointing to the strong homegrown contribution to those threats. Take, for instance, the brothers Hatim and Suleymaan R., raised in the Netherlands. Hatim, has been on the Dutch terrorist list since 2014 but is believed to have been in Syria since 2013. He was sentenced to six years in prison in absentia in December for terrorist activity. On March 15, a Rotterdam court found Suleymaan guilty of sending €17,000 to his brother, which the judge determined constituted financial support to a terrorist. His 18-month sentence marked the first conviction in the Netherlands based on a newly-sharpened law against terror financing. Yet even as Suleymaan R. attempted to defend himself in Rotterdam Tuesday, police just across the Dutch border in Brussels, Belgium, swarmed the streets of the Vorst district in the ongoing search for Salah Abdeslam, alleged mastermind of the Paris attacks, who has been traced to the nearby Brussels district of Molenbeek. Ongoing police investigations led to numerous arrests of other suspected ISIS sympathizers, some alleged to have known Abdeslam, though no trace had yet been found of the terrorist leader himself. But in Vorst, during a raid that lasted several hours and in which one suspect was killed and four policemen injured, investigators uncovered an ISIS flag, a book about Salafism, a sizable cache of weapons, and more importantly, Salah Abdeslam's fingerprints. Three days later, on March 18, Abdeslam was picked up with two other suspects in a flat in Molenbeek. "We've got him," Belgian minister Théo Francken wrote on his Twitter feed. Even before Abdeslam was found, counterterrorism expert Claude Moniquet told Belgian news agency Belga that he expected more attacks like those of Nov. 13 in Paris. As spring approaches, he warned, ground and air attacks against ISIS will increase, weakening their military. Consequently, he expects the terrorists to seek a distraction through European attacks. "It is not clear whether many counter-terrorism measures, such as those in Vorst, will really affect that," he told Belga. "The incident in Forest shows that the jihadists are very determined. These are people who pull the trigger even before they think or talk. One cannot negotiate with them. There is no discussion. They are there to kill or be killed."